Expand American University to Ward 8? 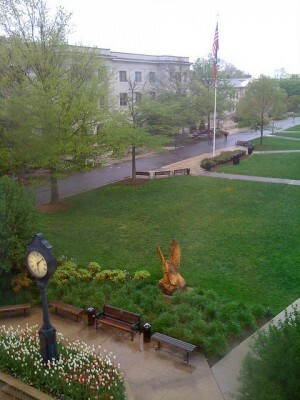 What could an AU expansion do for Ward 8? … American University would be perfectly suited to Anacostia and Congress Heights: MLK [Avenue] would fill up with coffeeshops and bars, students would have all the low-cost housing they could ask for, and local residents could benefit from jobs that don’t require a high-level security clearance–not to mention the opportunities of a credible institution of higher learning in their backyard. In exchange, the proposed Department of Homeland Security at St. Elizabeths could instead go to Ward 3. Given the high unemployment rate in Ward 8 — 18.6 percent — compared to 3.6 percent in Ward 3, maybe the switch isn’t such a bad idea. 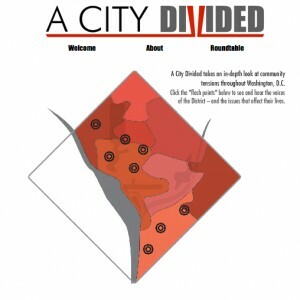 A City Divided looks at D.C's issues with class, gentrification and more. Yesterday, I posted an in-depth discussion with Jeremy Borden, Managing Editor of “A City Divided“, a special edition of the American Observer. Today, I’m serving up an interview with Dan Merica, who wrote “Different worlds reflected in the barber’s mirror” for the project. Ever since I was young, I have found Barbershops interesting. People who come in don’t know each other, but they are still comfortable enough to talk. I was always fascinated by the range of conversations that happened. When I thought of this piece, I wanted to pick something that the two wards had in common. I considered ice cream parlors, bars, hardware stores…something that both wards have, but barbershops were the perfect place. Which patrons were most interesting to talk to? There was a guy named Tucker, he was the focus of the piece, he had just got out of jail– his perspective really struck me. As promised, here is my interview with Jeremy Borden of “A City Divided“. Jeremy was the Managing Editor of this special edition of the American Observer, which examined many of the same issues DCentric does. It’s been great as a whole. Even though people have their specific critiques, that shows they’re looking at the stories and reflecting on them. That is advancing the conversation in a way that is very positive. What was the impetus behind the project? What we tried to do was hone in on the broader trends that came out of the September primaries. We knew there was all this divisiveness that had been written about in a broad way; we wanted to focus on specific narratives that exposed divisions in the city and also illuminated the big issues of that election. That’s a difficult thing to do, but I think one of the things that has been most pleasing to me is that we did hone in on narratives that matter to people. Look at the conversations people are having, they are good conversations about the issues affecting this city. What about the smattering of negative reactions you’ve received online? As journalists we do the best that we can within the constructs set out for us. 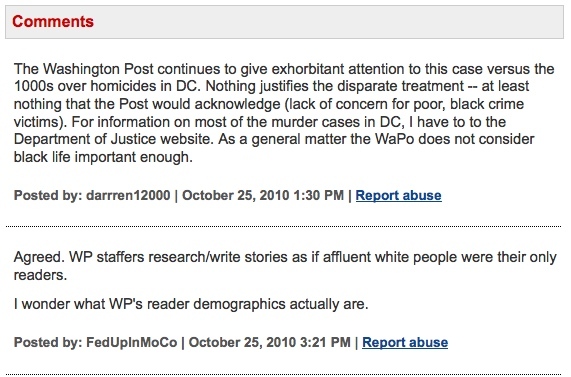 What I think is extremely unfair– and there was only one comment like this, that felt we were being racist in our coverage…I felt the need to respond to that. Not everyone will have the same point of view, but all in all it’s been a really positive thing. An hour ago, I spoke to Jeremy Borden; he’s the Managing Editor of “A City Divided”, the multi-media-enhanced special edition of American University’s graduate online publication, the American Observer. “A City Divided” has (rightly) received coverage from the City Paper, DCist, NBC and other sites that focus on D.C. and its neighborhoods– but all of those posts were intended to alert readers about the project’s existence. I wanted to know more, so I reached out to Borden and interviewed him about ACD, the reactions it has received and…why the buzzed-about story “Priced out in Columbia Heights” featured three compelling interviews with residents of Mt. Pleasant. I’m due to speak to him again, in a few minutes– he generously agreed to be interviewed while he tries to finish up projects/classes at AU– so look for that post, tomorrow. In the meantime, if you haven’t already seen it, check out “A City Divided“. Any regular reader of this blog will recognize the themes of gentrification, racial lines and community tensions; you might enjoy the spirited conversation the project has inspired, too. One of you kindly sent me a link to “Behind The Research”, a series from The Atlanta Post that “explores the dynamic work of African-American professors around the country”. The first profile for Behind The Research is of Dr. Sabiyah Prince; coincidentally, she’s part of the Anthropology department here at American University. I thought her name sounded familiar and then I realized that she had been on my favorite NPR program ever, Morning Edition, to discuss the Real Housewives of D.C. with Neda Ulaby, back in August. I’ve done research over the last five years and right now I’m writing for my book which is about how Washington DC is changing demographically and how African-Americans are affected by the changes, how they are interpreting the changes and how they are responding to the changes. The African-American population in DC has been gradually decreasing since the 1970s. What an amazing potential resource for DCentric (seriously, thank you to NG for this link). How do you integrate your personal insight into your research? Police went to Benning Road and attempted to stop the Jeep, Bonilla said, then gave chase when Hamlin allegedly tried to drive away. The Jeep crashed into a crosswalk signpost at the intersection of New York Avenue and M Street NW. Hamlin, who police said lives in Northwest Washington, was taken into custody and charged with unauthorized use of a vehicle and felony fleeing.